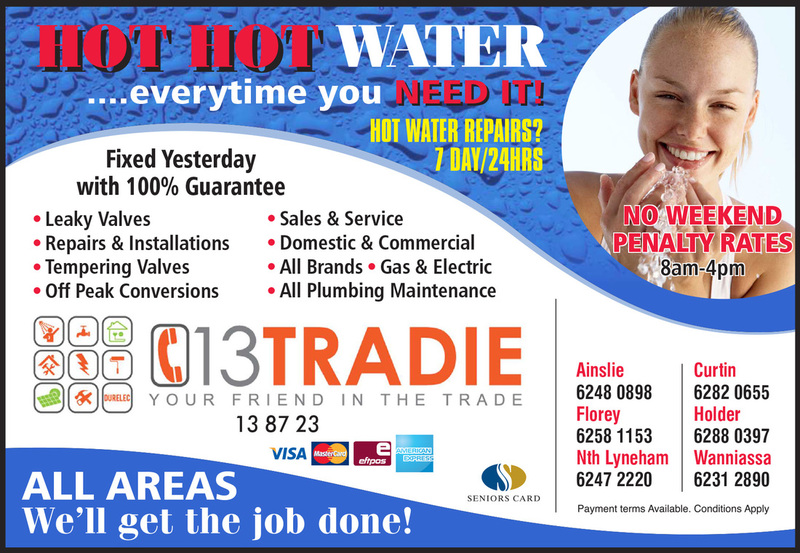 Plumbing: Adelaide, Brisbane, Canberra, Darwin, Melbourne, Perth, Sydney, Wollongong, Queanbeyan. Yellow Pages Advertisement Canberra Directory 2015 Plumbing. Hot Hot Water...everytime you Need it! Hot Water Repairs 7days/24hrs. Fixed Yesterday with a 100% guarantee - No Weekend Penalty rates 8am to 4pm. -leaky valves - sales and service - repairs and installations - domestic and commercial - tempering valves - all brands - gas and electric - off peak conversions - all plumbing maintenance. Durelec Plumbers and Electricians. Visa Card, Master Card, EFTPOS and American Express. Seniors Card. Payment terms available conditions apply. Adelaide, Brisbane, Canberra, Darwin, Melbourne, Perth, Sydney, Wollongong, Queanbeyan. Call 13TRADIE - We'll Get the Job Done!